Pricing Importance From a strategic perspective, pricing has more impact on positioning and ultimate profitability than any other item in the overall marketing mix. Depending on market sensitivities and current profit margins, a 1% increase in price could increase profitability by up to 10%. In most companies, prices are tactically derived based on internal costs and gut reaction to competitive moves. The key to effective strategic pricing is to leverage market based understanding of how customer's value new and existing offerings in a competitive marketplace. Key questions addressed in strategic pricing How do I insure that my pricing decisions will support the overall long term positioning of my product? For a specific offering in a category, at what price will I maximize the overall profitability for the entire company share in the category? When introducing a new product, or a extension, what will be the impact on existing products? How can I develop and price package offerings to enhance overall profitability? How do I tailor pricing and package offerings to meet the unique needs of my most valuable customers? For branded products, how can I effectively compete with value/generic offerings? How do I determine the specific benefits that customers are willing to pay more for? What will the impact of competitive responses be to my new offerings and how would that change my optimal offering/price? If market constraints force development of short term strategies, how do I minimize the impact on overall positioning? Approach to Strategic Pricing SDR's approach to strategic pricing is to effectively understand the customer's willingness to pay in a competitive marketplace. As detailed in all of our approaches, SDR uses customer input to develop models of marketplace behavior. The key to these models are that they carefully parallel customer's purchasing decisions and are not limited by any artifacts of a particular research technique. While SDR employs knowledge gained from prior studies, it approaches each new engagement as a custom study designed to address all relevant issues. Study design is critically important. Working with you, SDR develops an in-depth understanding of all key issues that potentially impact the strategic direction for the product/service offering to insure that all strategic outcomes can be properly explored. Many companies use historical data, either internal databases or scanner type data sources, to determine the impact that price has on volume. While these databases produce very accurate share numbers, their ability to isolate the impact of price on sales is limited for a couple of reasons. Problems arise in being able to control items such as availability, consistent pricing in all locations, and competitive pricing and promotions. In addition, it is not a good idea to use the marketplace to test changes to prices and you can only test currently available products. In SDR's approach, historical data is used to calibrate the models in order that they reflect current market conditions, but then use primary customer information to model changes to price and acceptance of new product/service offerings. SDR further enhances it's approach by separately modeling the customers in the primary research by their choice behavior. Since customers exhibit different behavior, some tend to be price sensitive, others more brand loyal and still others who have specific feature affinities, SDR first groups all respondents into these behavioral segments and then develops a model for each of these segments. These models lead to more targeted strategies designed to meet the unique needs of the most valuable customers. In order for management to fully understand the implications of recommended pricing strategies, SDR reports the findings of a study in bottom line profitability numbers. In most cases, information from other pricing studies are reported in simple percentages indicating the percent of customers willing to purchase a product/service at a particular price. Obviously, changes to price will cause some change in volume, and this change comes from a determination of a customer's willingness to pay for a particular product/service. However, optimizing price based on profitability rather than sales will lead to strategies that will be more stable over time and provide a focus on profitability rather than sales. 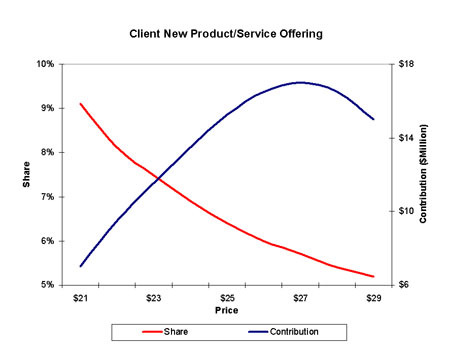 The following chart shows how dramatic an optimization based on profit can differ from a volumetric one. Once the initial strategies have been developed, SDR then assists in the implementation of the findings. In many engagements, the circumstances around the initial objectives changes focus and it is very important to consider secondary and tertiary objectives. In addition, SDR assists in the interpreting the results vis-à-vis the implications of changing price for the individual product/service in the context of the overall positioning and marketing mix for all the companies offerings in the category.